I was at the mall 2 weeks ago and I can't help myself admiring all those beautiful blouses and bags that I'm seeing. As a result, I bought 2 blouses, one is a boyfriend shirt and the other is a white blouse that I have not worn yet till now. I was looking for a bag but could not find that perfect shape that I wanted. I went to Aldo, Celine, Nine West, Guess and Girbaud but still there's no hobo bag that will suite me. Oh well I guess that's a sign that I should not shop for a new bag yet since I have quite a few of them already. I just hope that I have some coupons this year so that I can grab some deals. 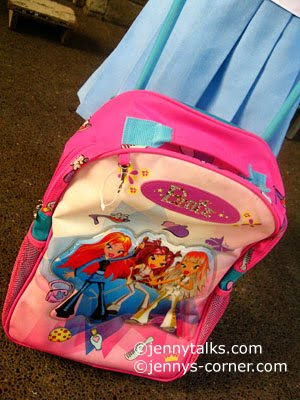 I'm also waiting for the items for sale of an online friend and before my b-day this year, I want another bag hehe! Ahhhh sometimes too much work can make us so stressed and to combat that we need to have some time off from work. A simple reading of magazine, watching TV or listening to music can already calm and relax us. If we are always stress, we'll be prone to sickness. I love listening to music to keep my mind away from too much thinking. I don’t have an ipod or any of those MP3 players so I just open Youtube if I’m already online or just turn on the radio to listen. 30 mins. of listening is already enough for me to be refresh and after that I can go back to work. 1. Long afternoon nap today. I got 3 hours of sleep after I had my bath after lunch. So refreshing indeed. Now I have the energy to stay up late tonight. Teeheee! 4. My dog Sophie following my command. 6. My internet connection at the house is back since yesterday, after being no net for about 2 weeks. 7. Chocolate chip cookies for snack. 8. Won at bi-weekly digi-scrapping designing at artscow once again. I’m truly blessed with work lately and I have never imagined that this will bring good chance for me to save. I’m trying to save little by little because these days, we’ll never know what lies ahead if we don’t have anything on our pockets. I’m also thinking of securing my health since I have noticed that I have frequent bouts of stomach discomfort that I know in the future will give me some trouble. but that is something that I need to think more. I don’t know about the trade so I guess I need to read more reviews. In the meantime, I will just save, save and save. Opps are pouring in! So thankful and feel so blessed!! Not every blogger is blessed with these. Actually I have many pending opps from different companies but I know I can finish them all before due date especially now that my net here at the house is back. Thanks Lord! Thank you! Thank you! Finally, I dragged myself out of my computer chair so that I can go to the salon. I've been wanting to relax and pamper myself for a while now but since I'm busy and lazy at the same time, I'm putting it off. Yesterday, after lunch, I went to my fave salon nearby and I had my hair cut, hair dyed and hair spa. Good thing is that my hair dresser gave me a massage after doing my hair spa and that made me relax. I had my hair color (almost black), to cover my gray hairs and to remove the almost brownish tint of my hair color. I was in the salon for 3 hours. Yey, thanks I got myself pampered! What would you do and feel when you’ll find out that a credit company where you got your loans, or credit cards sold your information to marketing companies? I know you’ll feel violated and vulnerable to identity theft and other illegal acts. A big controversy has erupted in the US between creditors and TransUnion, a credit bureau when it was known that TransUnion sold credit information to marketing companies which is illegal. They have also known to have violated the Federal Credit Reporting Act. So if you have credits between 1987 and 2000, you can now file against TransUnion and you’ll have the right to have part in the $75 million fund for claimants. You can ask for free consultation and seek legal help from O’Hanlon, McCollom and Demerath law firm and hurry up because it’s only until September 16, 2010 where claims can be accepted. Something is coming up in few more months and I'm already excited over it. Can't wait for the day that it will happen. I'm keeping my fingers crossed that it will flow smoothly and no one will jinx it. I can't sleep every time I think about it. Yay! time run fast please! :) I'm so giddy. Here's my new kit BIRTHDAY BASH that I made about couple of weeks ago and it is now up for grabs at ARTSCOW for free from July 10 till midnight of July 24, 2010 (Phil. Time). Only those with Artscow account can avail of these so if you want to make photobooks using my kit then you need to sign up at ARTSCOW first. You can add this kit and can even use the quickpages and copy the sample photobook that I made. Add this kit HERE. A Much Needed Haircut etc. If you’re a busy blogger like me that needs to be online almost 24/7 there will come a time where you feel tired and exhausted but so blessed. 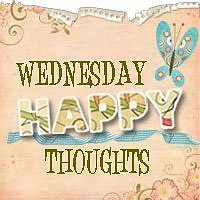 With the enormous opps that requires a lot of time and thinking; at some point the thoughts that needed to be put in our posts are not coming. We also need to be patient because when payday comes all of us will be beaming. in the US because for sure he’ll learn more techniques and gain more experience. Now, I’m hoping I can sneak couple of hours tomorrow to go to the salon. Sorry this is a rant post. Storm Basyang came last July 13th and by midnight we don't have electricity already and when our power got back after 23 hours (july14) I checked our internet connection but there's none. It's still ok not having connection because I know that there are lots of lines that went down during the storm. I called the Smart hotline but I was on the phone for 20 mins. already and no one is answering yet so I hung up. I then asked my mom to go to Smart office by Saturday to report it and they'd say that they will just call us. No one is calling yet so she went back again around Wednesday to pay our smart bill and to follow up on the complaint. Up to now there's no Internet connection. It's very hard for me not having net connection because my work is online. Fortunately the net connection here at my net cafe is not cut off so I can work here. I even sleep here when I have tons of work to do. I hope this coming week they will fix the antenna because I can't wait any longer!! I have quite few blogs (don't ask any more how many hehe) under my wings but I thought of adding another one. Yes another one! I'm still tweaking the template and adding some more posts and once it is finish, I will share it to you. I have different niches on blogs so I thought I'll have a food, nutrition, health and home blog this time. I have so many ideas to write there but I became busy so I'd just continue it once I'm free. I’m so very happy that work is pouring in once again. When it rains, it pours just like they say. Not all are blessed with it so I have to be thankful and remind myself that all of these graces came from God. I can see hefty payday soon and I think I deserve a pat on the shoulder and little treat for myself. Hmmm.. what do I want? Since I can’t actually buy gold bullion and make it as an investment, perhaps a salon time or materials things like blouse or bag can already make me so happy. I guess in the future when I have enough moolah I can buy gold then. In the meantime, I have to work harder and continue to praise God for his blessings. I rarely do memes here but thought I'd do this today. And...here we go! 1. I feel inspired today making posts on my other blog and hopefully I can share it soon to everyone. 2. I need to catch up with my posts on my other blogs, they are somewhat taken for granted because I'm a bit busy. 3. Do share some of your blessings for you will be rewarded. 4. My personality is somewhat completely unique. 5. It's hard to know how much time will I spend while waiting for my net in the house to be re-connected. Smart's technician is not coming yet and it's already making me angry. 6. I just noticed that when someone share their smiles, everyone else follows suit. 7. And as for the weekend, tonight I'm looking forward to finishing some of my online tasks, tomorrow my plans include and Sunday, I want to waking up early and opening my store early as wellgo to the salon for my hair dye and hair spa! When it comes down to it I think mostly all of us would really want to own a place that we can really call our own. I’m so happy for my online friend who has just moved into their "little mansion" as they call it. A cousin of mine also recently moved into their new house that they built from scratch, and right now, my sister and her husband in Sydney is actually at the first stage in their house construction. I can only imagine all the joys and excitement they all must be feeling now that such a big dream is being fulfilled. I reckon just one of the most exciting things in life is building a house. Though it may seem like an overwhelming project to undertake, I guess if you have the right budget, good , and reliable builders then it is a dream that is 100% achievable. Online can be a great source of ideas and necessary tools to help you get started. If you are planning on building a house one of the first things you need are professionally designed house plans. If you are interested in looking at some house plans. You will see that the website has over 10,000 different pre-drawn home plans done by their professional design team. It can be really interesting to look at the designs and see the different set up of the rooms and the different features of each home. Select your favorite style of house from the myriad of styles there, and then search through the house plans for that style of home. Carefully peruse the specifications and see if there is a house plan that you really like. Chances are with so many plans to choose from you will find one you like. If you can't find one that is exactly what you want, you can have a plan customized for you, or their company's designers can do a complete customized home for you. With so many options available, this website will help you achieve one of the first and most steps in building home, acquiring a well designedhouse plan for the house of your dreams. Thank God for online works as it make me oh so busy these days. If not for this work, I guess I'm already in limbo where to find money to pay for some bills (not that I have lots anyway). I feel blessed when works are pouring in, I never imagined that it can bring some bacon on our table. Though there are times I'm so tired because I'm staying a bit late working, I'm still so thankful. Work is still pouring in and for sure more will come. I hope that despite I'm busy, I can still find time for myself. I've been putting off my salon appointment due to work for the last couple of months but I'm keeping my fingers crossed that this Sunday I can go already because my gray hairs are just so unsightly to see. I also need to get the auto insurance reviews done that older bro needed bec. our vehicle is due for renewal once again. On this day of your life, Jen, we believe God wants you to know ... that you are perfect as you are. My oldest sister is still in the country for a vacation and there are times we had conversations about business and other possible sidelines. She’s working in Saudi together with her husband and since their 3 children are on in college, there are times that the salary is just quite not enough to sustain all their needs. She’s been exerting some efforts, selling some goods to her officemates and at least it’s generating a little income than nothing. We’ve been thinking of another sideline and frankly it’s hard to just put some money on a business you know nothing about. Anyway, gold coins seem to be a good choice but we need to learn the trade on how to sell them, maybe in the future. For those that want ton invest in, just deal with certified seller. Sometimes I’m having hard time watching local news for I just end up feeling sad because of all the crimes that have been happening around the country. Aside from that oil spill, recent storm and some huge fire that has eaten up lots of houses and commercial establishments has been the top news and it’s just heartbreaking. I also clearly remember the huge fire that hits our town’s market. Sad to say that up to now, some business owners don’t have any decent place to sell their goods. I reckon that most of the stall owners don’t even have business insurance that makes their situation pitiful. If only they can avail and check out the affordable quotes for business insurance then perhaps I guess they’ll get one. I think some of the factors that veer them away from getting insurance is high payments and hidden charges. Just in case you have business, you might want to insure it because we’ll never really know when disaster will strike. It’s like a thief in the night that will just come and steal your entire livelihood. You check out your local insurance company like business insurance in Louisiana or insurance for business in Utah to get you covered. There’s nothing like having peace of mind. I’m actually a t-shirt person and if you’ll invade my closet then for sure you’ll drown in it hehe. I think I have almost all the colors and will be buying new ones soon. T-shirt gives me much comfort so I use it almost everyday while working here in my shop. I guess most people around the world can consider t-shirts as part of their wardrobe. Designers are actually coming up with new designs every now and then so that customers have variety to choose from. I noticed that custom tshirt are “in” thing these days. There are stores offering customized t-shirt printing where their customers can choose among their designs and they will print it. You can have your name, picture, logo or anything printed on your shirt. Some even used it to give it as promotional items or give-away as part of their advertisement. There are also blogs devoted to t-shirt love like Death by T-Shirt, which I guess will be re-launched. There are actually wide varieties of shirts like family/baby, animals. sports tshirts, joke shirts, slogans and more that we can also give us gifts. If you’re a designer and want your designs to be printed on shirts, you can either be a member of café press where you can create, sell and buy "print on-demand" products. Back in 2007, I used to design for an online scrapping store and one of my designs where used to be printed in various merchandise. Wow, I can hear the heavy wind and rain outside right now. Storm Basyang is here already and I'm praying and hoping that this will not be that destructive. Storm signals all over the country are up already. Metro Manila and other nearby provinces are signal no. 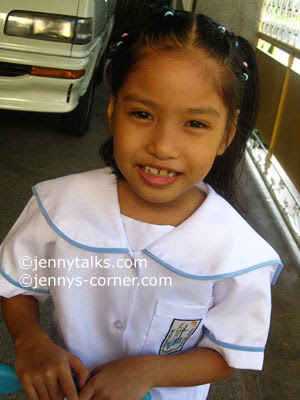 2 already, so that only means that there's no classes tomorrow from Pre-school, Elementary and Highschool. I can definitely say that a love for the arts runs in our family. My dad use to do paintings in his younger years and fortunately we have saved some of his art paintings in our house. They are quite good and I think of him every time I look at them. 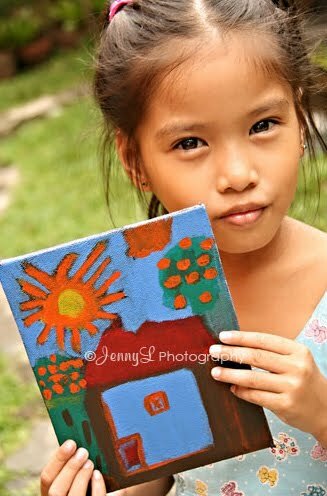 My older brothers are also visual artists; in fact, they have competed in local art competitions. My older brother has won several times and he is continuously competing in other contests. His children seem to have his artistic genes and now they are into photography and film making. If I may say, not wanting boast, I myself am into digital kit designing, photography and more. I reckon it is a great gift from God that we can be proud of. The kids in our family are also showing signs of being artists and we are always encouraging them to express themselves through art. Sometimes during their vacation they take art lessons, and I am always trying to find different art activities for them to do. It is fun watching your kids create things, and they are always so proud of what they have made. I am happy to be able to encourage my kids to explore their creative genes that seem to run in our family. The weekend has passed once again and I've been busy ever. My online works poured in over the weekend and I have no choice but to do it asap because I want to beat the deadline. I was not feeling well those days, been cranky, cramps on my legs, I have colds and my migraine attacked while I'm working. Thanks to medicines that really helped my aches and pains. I guess I've also abused my body a little bit by working on my opps till 1 or 2 am and I've also designing digital scrapboooking kits on the side. Yay, I'm multi-tasking lately. I've been putting off my schedule to go to the salon last week and gosh I really need to go there before the week ends. I'll be meeting my online friends on Friday, so I guess that's a great way to unwind and have some chitchats. If I still have time to go to the mall after our lunch, probably I can also look for outdoor patio cushions at the mall that I needed for our house. I'm already looking forward to our lunch date. I suddenly remembered The Biggest Loser TV show and the weight loss success stories of the contestants when I saw this sneak preview of the The Biggest Loser Philippines on You Tube. So ABS_CBN is going to air the show (not quite sure when) and right now they are having auditions at different places. I'm sure many will go to audition and who knows they might win and lose their unwanted fats. My sister Beng who is in the country these days for her vacation is actually enjoying her stay. Why not? She's been seeing her elementary and highschool friends almost all the time at their gatherings. One time she invited them here for dinner and it was already early morning when the party was over. The other night she went to her friend's house for another bbq dinner get together and again tonight. Wow she's really enjoying and taking advantage of her vacation. Looks like she needs lipozene after all the pigging out is over. 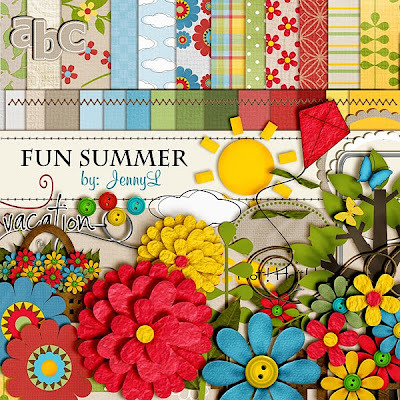 I've been busy these past few days making this new FUN SUMMER digi-kit. I'm sharing this for FREE at Artscow once again but for a limited time only (2 weeks). So if you have an account at ARTSCOW, add this to your collection of kits HERE so that you can use it to decorate your digi-layouts. Hurry because after 2 weeks and the contest I will have it for sale already. 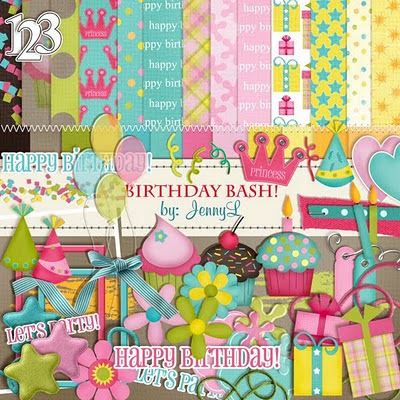 If you have not tried digital scrapbooking, ahhh you better start this fun hobbby. Hey all, how's your week so far? It's Friday once again and I know many of you are looking forward for the weekend to spend it with your family. My week is productive but tiring. I've been posting left and right and still managing to design a digi kit as my entry again at Artscow this Saturday. Yesterday was just exhausting as I've posted on my other blog because I've been trying to make lots of quickpages for the kit that I've made. I also need to start some online works because it pour again just yesterday morning. I have to schedule my blogging so that I can finish them on time. I also need to read apidexin reviews and read Photoshop and Adobe Illustrator tutorials. Last night, I started to work late at 11:30 pm and slept at 2:30 am when my eyes started to get heavy and when I lost my internet connection. Looks like it's gonna be a busy weekend for me but I also need to give time to myself. The salon is already calling for me to get my hair done. I've been a bit lazy downloading and uploading photos lately so these photos are way too late already but I'm still sharing them anyway. 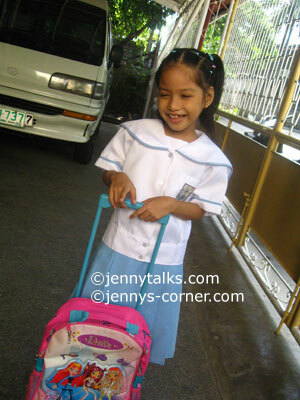 These are photos of my niece Reign before going to school on the 1st day of classes last June. She was excited and joyful because she's on first grade already. 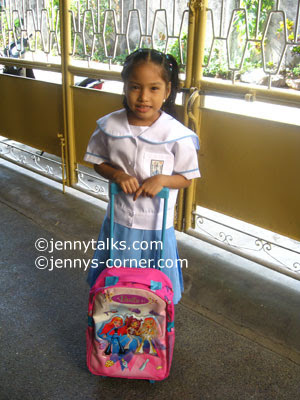 She's got new uniform, shoes, bag and school supplies. My 2 nephews have decided to shed some of their weight because they are big already. During summer, they are religiously not eating rice, only veggies and meat are their food everyday. I guess it's doing good on them and they see some results that's why they continued it for months. Now that school started once again, I asked them if they are still not eating rice and one of my nephew could not take not eating rice anymore so he went back to his normal eating habits. Haha I knew that he can't resist rice. I know that they want a great body but if they don't exercise then I don't think they can achieve it. Funny thing is that my younger nephew is on the heavy side once again. Thank heavens, my mom's blood pressure is improving already. After being high at 160/80 when we rushed her to the hospital about a month ago, her BP went down as low as 110/70 after her doctor gave here medicines. It was not normal for her to have 110 bp so every now and then we are going back to the doctor to see what med. will really suit her. It looks like the medicine that she is taking now is making her blood pressure more normal at 120/70 and I hope together with her natural cholesterol treatment, her health will be good once again. Though she is really trying to be healthy at 77, the doctor said that her blood pressure and her cholesterol levels will be up and down but with the help of medicines it can normalize it. Wow can you believe it, half of the year has gone by and now we are in the second half of 2010? I've been busy these couple of months doing my online works and also digi-designing. I've been jumping on my blogs one by one finishing all my tasks. There are times that I though I'll not be able to finish them but luckily eventhough my brain is fried already hehe, I still managed to finish them. Lots of blessings come my way and I hope more to come hehe.